Loving all the spring blooms, especially our beautiful dogwood out front! I hope you had a wonderful Easter weekend, the weather couldn't have been better here in KC. Last year we moved into our house over Easter so I’ve been feeling especially sentimental and grateful. One whole year of home-ownership! I almost always restrain myself from buying flowers on my weekly trip to Trader Joe’s but these tulips caught my eye. 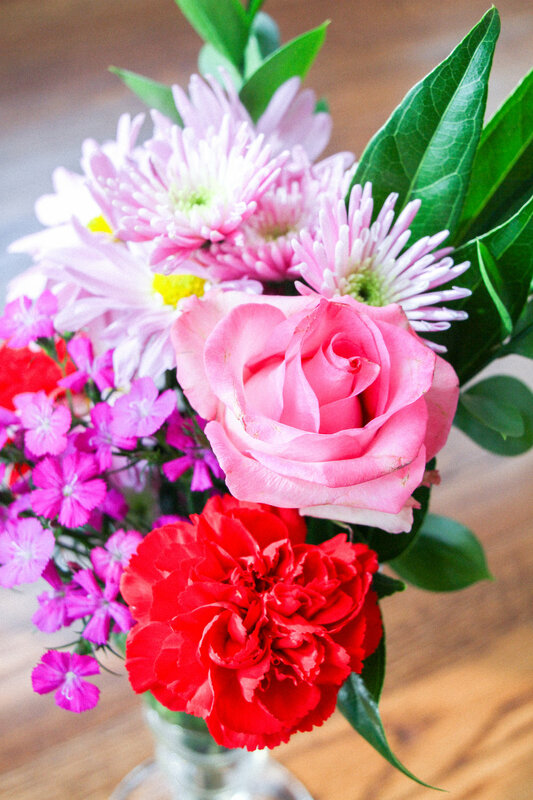 It wouldn’t really be Spring without some new blooms, would it? This snowy month was full of memories including a trip to Lawrence to recruit for Hallmark Creative interns, lots of Mother’s Day work, a Valentine’s dinner at Avenues, several amazing brunches with friends, a lovely birthday dinner with family at Lidia’s, and after making this list I have realized basically lots of wonderful meals shared with family and friends! I always look forward to February because Valentine’s Day is right before my birthday and it’s definitely a bright spot in my midwest winters. I made lots of discoveries around the web, too! Did you know you can download free high-res prints from Audubon? I think these would be lovely framed! I also learned the State Bird of Missouri is the blue-bird which would definitely match our decor! Are you as obsessed with How To Train Your Dragon as we are? Dale and I saw the third movie in theaters last weekend! I’m always on the lookout for new pasta recipes and this one is on the list for March! Julia’s front porch has me even more excited for gardening this year! I found this list SUPER relatable. A few items I received off my wish-list for my birthday this year: this sweater, these dryer balls, & a new stand for all my earrings! A candle DIY on my list to try! Last, but definitely not least, some bathroom inspiration from The Makerista! Hello, friends! I was so excited about the sunny weather we had today I couldn’t help but snap a few photos. I’m really enjoying our new kitchen, and I think Otto is too. Valentine’s Day is my second favorite holiday (after Christmas) and it’s right around the corner! Here is a roundup of some of my favorite inspiration to celebrate this year.